Select an option XS-S / Knee 38" XS-S / Calf 45" XS-S / Ankle 55" M-L / Knee 38" M-L / Calf 45" M-L / Ankle 55" XL-2XL / Knee 38" XL-2XL / Calf 45" XL-2XL / Ankle 55"
🎈Each includes a FREE headband for the mommy! 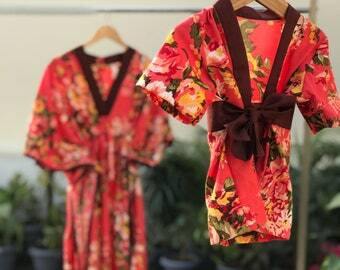 Each of our Kaftan is carefully handcrafted from special soft fabric, printed with lovely florals. 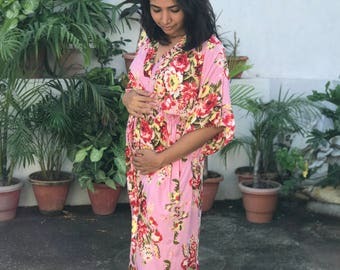 Soft cotton fabric provides the necessary comfort during pregnancy and our wonderful floral prints will make you feel like sunshine throughout the entire pregnancy and afterwards. The house of High Quality, extremely comfortable and durable gowns! At very reasonable costs. Do treat yourself and your newborn to these pretty maternity sets. Choose from the options and create your favorite combination! A must have for any hospital bag. 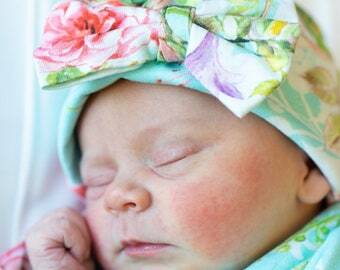 These make fantastic first baby pictures as well, take my word for it. I have helped hundreds of women feel like a Goddess through their pregnancies and delivery. Its time you ordered a set for yourself too! And your order will come knocking on your door before you even know it! Thanks to FedEx and DHL, my shipping partners. Please message me if you need to contact me for anything. I am very happy to accommodate your custom requests. I will put it in a sturdy tote bag, and embroider the name (please let me know the name you'd like embroidered! 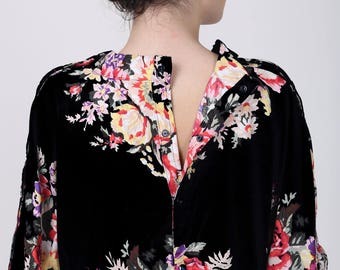 Add on: BACK and NURSING open to the robe or kaftan, if you have not added it after buying your regular robe / kaftan without it. Exceeded my expectation! I ordered 3 kaftans with lining & feeding buttons. I really recommend having the lining, makes them feel more substantial & luxurious. (I've had gowns from a different shop 3 years ago, they didnt come with lining & so were thin and got very battered). These ones are really of great quality & i've been wearing them everyday since! 10/10 from me!! The Kaftan gowns are One size fits Most. If you are worried about fitting or any other issues, Please CONVO me before placing the order. I am unable to accept returns. If the item is damaged or not what you had ordered, I will certainly resolve it. Processing time: I plan per your NEED BY date. I provide tracking number when I ship out. SIGNATURE is required for Delivery. Combined shipping is much cheaper, as for every additional item shipping addition is only 3 USD. I have noticed that Canada and UK levies DUTY & TAXES, which are to be borne by the buyer. I have not included the same in my shipping or robe costs. Choose your Pre Pregnancy Size from my size chart. I make robes with room for your baby bump. If unsure, or think that you've grown larger than other expecting mothers around, you may go for one size UP. A size bigger is better than a size smaller, for we dont want it too clingy and get hot..! Please write to me via convo.. I am always excited to try new things, or customize details..! Wash with LIKE colors for the first time. Machine wash on short cycle is OKAY. Its best to Hang to Dry, as the material is cotton, and it will wrinkle. So when you hang to dry (instead of using the Dryer), it wrinkles less. A little ironing or steam, and the garment will look wonderful! Let me know your message in the NOTE TO SELLER at checkout. Write to me via Convo. I am excited to do wholesale orders. Yes, a signature is required to ensure a safe and sure delivery. All deliveries happen during the day. Please order on office/ alternate address if that suits you better. What is SOLO, DUO, TRIO...? You can always ask me to add lining to your robe, add extra swaddle and a baby robe to your set. I will help you with necessary links.